The wooden xylophone can be found in all parts of Africa. It is actually one of the continent's most prominent instruments and is deeply rooted in its many different cultures. You are about to discover a surprising variety! At first, their music may sound unusual to a Western ear, because the African scales and techniques are different from what we are used to. But it is worth diving into this marvelous world. After all, the history of the xylophone of the West includes these African ancestors. The African balafon is the traditional xylophone of the Mande people, which are spread across several countries of West Africa, such as Guinea, Mali, Senegal, Gambia and the Ivory Coast etc. To better understand why their instrument has been so important to the cultural identity of the Mande people, read about African balafon history - The Sosso Bala. Because this Malinke term is well known in the West, we often assume that Balafon is the name for all African xylophones. In reality though, there is a large number of other African tribes with long traditions, that are just as interesting and important. 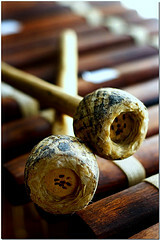 The Baan is a type of Balafon and an instrument of communication. Just like talking drums, it is able to speak. What you think is just an interesting melody, is in reality the musical imitation of the villager's Sambla language. Everything the villagers talk about can also be said through the Baan. He may complain about being hungry and ask you for money to buy food. The children of the village learn the language of the Baan at the same time as they learn to speak. What would you say if you could speak through your instrument? The droning sound of the Gyil in Ghana immediately got me hooked: I took lessons. But distracted by running children, drying laundry, clucking chickens and Muslim prayer calls I admit I didn't advance all that much. The Lobi, Sisala and Dagara people are the real masters of this buzzing instrument. They use two basic versions: Traditionally, the kogyil is played at funerals, while the borgyil accompanies festivals. Today, the Gyil also makes a very cool addition to Ghana's neo-traditional music groups like Hewale Sounds. The unusual buzzing sound of the Gyil is no accident. It is achieved by drawing the net of spider cocoons over wholes in the resonating gourds. The builder "hangs" the 14 wooden bars over the frame to allow them to vibrate freely. Most Gyils are tuned in the pentatonic scale. No worries, your speakers work fine. The Gyil actually sounds that cool! The Timbila music of the Chopi tribe is the recognized national music of Mozambique. It is one of the most spectacular and complex artistic expressions to be found on the African continent. The Timbila comes in many different sizes and ranges of pitch. A traditional orchestra can be composed of up to 30(!) Timbilas. This is a performance of an 11-piece orchestra. Imagine how it must sound when 30 of these amazing musicians play together! Above four examples just give a taste of the rich variety of wooden xylophones in Africa. In reality, I could add a long list of other ones played by the many different tribes on the continent.